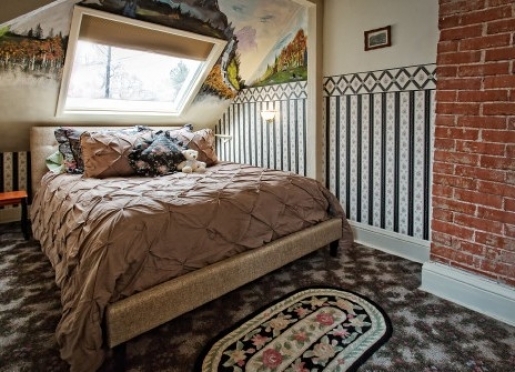 Imagine three storybook Victorian homes filled with antiques and family heirlooms. Holden House 1902 Bed & Breakfast, located in Colorado Springs, CO, fits the description. In 1902, Mrs. Isabel Holden, the widow of former rancher and prosperous Colorado Springs businessman Daniel M. Holden, built this Colonial Revival Victorian and carriage house. The Holdens owned considerable mining interests in the Colorado towns of Aspen, Cripple Creek, Goldfield, Silverton, Independence and for which five of the six spacious guest suites are named. The memories of Isabel and her family live on today in Holden House. The inn is centrally located on a quiet tree-lined residential street, convenient to downtown, near historic "Old Colorado City" and just a few minutes from quaint Manitou Springs. Travelers are always looking for memorable and relaxing experiences. Let’s discover more through the words of our innkeepers. 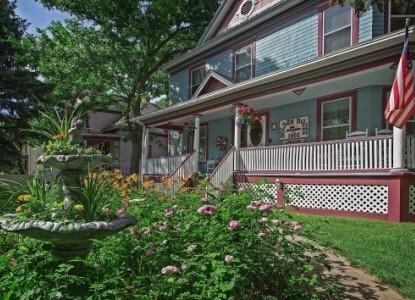 Many thanks to Holden House 1902 Bed & Breakfast Inn for sharing their secrets with BBOnline.com! While there are many reasons our guests select Holden House, we believe that our central location and the historic surroundings set our inn apart from the rest. Here you will find the flavor of our historic “Old Colorado City” area combined with the modern amenities of a business-class hotel. Our inn’s location on a quiet residential tree-lined street provides a great homebase to sightsee or relax in Victorian splendor and dream about a simpler time. Our hospitality and breakfast service is well-known with knowledgeable innkeepers to assist guests with whatever their needs. Activities around the region, directions to our favorite parks and attractions, excellent restaurant choices or shopping districts are the hallmark of service at Holden House. 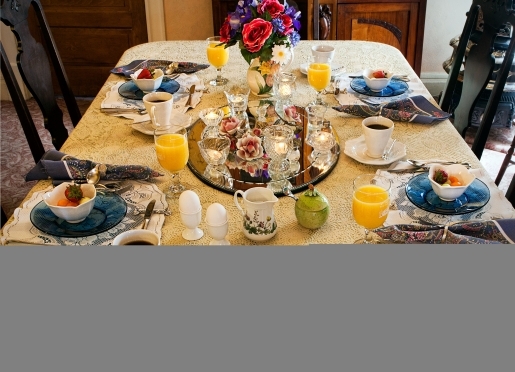 Our lovingly and deliciously prepared breakfasts, served in the dining room (included) or in the privacy of your suite (additional charge) offers well-seasoned B&B travelers or B&B “newbie’s” a chance to experience exceptional and breakfast lodging. Our menus vary from day to day which provides a unique entrée dish each morning accompanied by home baked muffins hot from the oven, a fresh fruit sundae and freshly ground and locally roasted coffee served each morning. 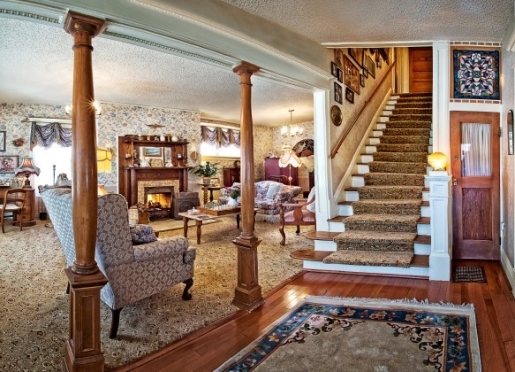 Holden House is the longest and well-established B&B in the area under the same ownership. Innkeeper/owners Sallie & Welling Clark restored the main house in 1986 and since that time, have added the carriage house and Victorian house next door to the accommodations to make up the current inn’s three building corner property. 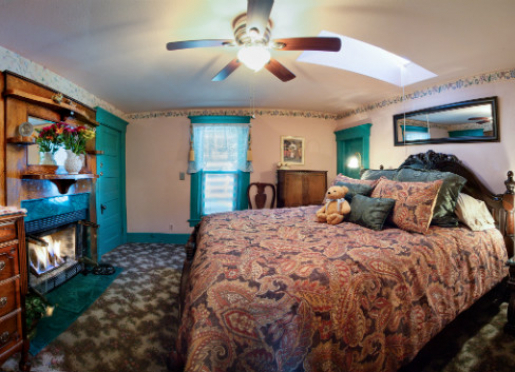 Each of the beautifully restored Victorian homes offers a personal touch with family heirlooms and antiques, comfortable guest rooms and up-to-date accommodations including all private baths, fireplaces, TV’s and WiFi, just to name a few. 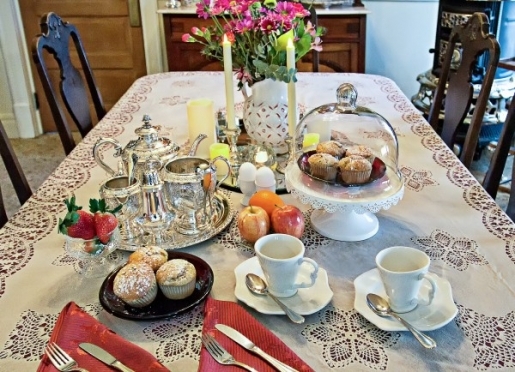 The warmth and ambiance of the Victorian atmosphere, the delicious homemade breakfasts and our afternoon wine social which includes individualized hospitality of innkeepers/staff. 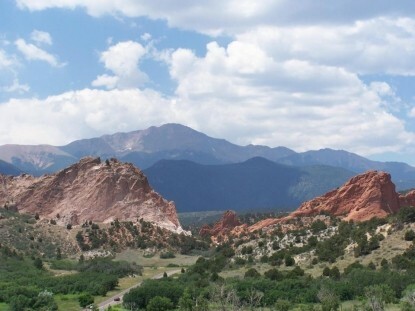 The outdoor beauty of the area is definitely a “must see” and it’s a toss-up between visiting the magnificent Garden of the Gods Park or the Pikes Peak Highway or Cog Railway. We have such marvelous scenic hiking trails that offer peace and quiet, unsurpassed views and vary from easy nature walks to rigorous hikes, depending on your abilities. We continually hear from guests about our immaculate guest rooms and compliments about our attention to every detail. Our beautiful summer evenings accompanied by porch swings and rocking chairs on the verandah or our secret garden with fountains and Adirondack chairs. Depending on the time of year, our area offers outdoor parks and hiking, trails, rock climbing, zip-lines or scenic drives, art galleries, shopping in historic districts or in upscale shops, cultural plays and music, festivals, gaming, historical tours and sites, the US Air Force Academy chapel and visitors center, the US Olympic Training Center, and many more activities, cultural and historic attractions and outdoor adventures. Several restaurants are close by, many within a one mile easy drive to either Downtown Colorado Springs or historic Old Colorado City or Manitou Springs. Paravicini’s Italian Bistro which is locally owned and operated with excellent service and exceptional food. 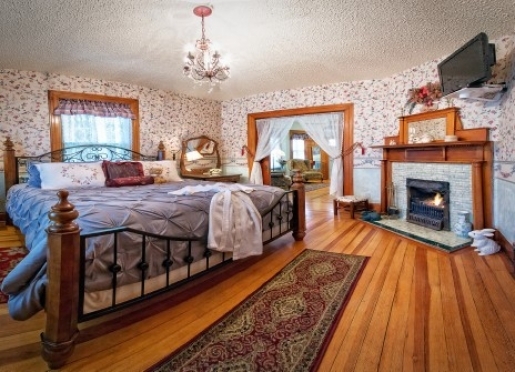 Six guest suites all with private baths and fireplaces. No, we have a resident InnCat, Mingtoy, who does not permit guest pets. We have a few local pet motels we can recommend for those traveling with pets. Holden House is the only bed and breakfast inn to be honored with the Historic Preservation Alliance Award of Excellence for Historic Preservation and Restoration. Sallie & Welling moved to Colorado in 1985, and lovingly restored the neglected 1902 Victorian and original carriage house. In 1986 they began welcoming guests to share in their love of old homes. The extensive renovation included the installation of a new foundation, plumbing, heating, wiring, landscaping and total restoration. In 1994, the adjacent Rose Victorian was also added to the inn. The Clarks look on the inn as a continuing project of love and labor for these classic Victorian homes. Guests can appreciate the renovation project by viewing the Holden House "Before & After" photograph album. Sallie and Welling share their home with resident Inncat Mingtoy. Sallie and Welling and the Holden House staff will help make your stay a special experience. We are known for distinctive accommodations and personalized service. Many of the inn's furnishings belonged to Sallie's grandmother who resided in Pueblo, Colorado. Family treasures include an 1898 Estate Oak parlor stove which was used on her grandmother's farm, an intricately designed silver tea service which belonged to her great grandmother, and a 200 year old Gaudy Welsh tea set originating from South Wales heritage. The many oriental keepsakes are reminiscent of Welling's travels in the Navy. An eclectic collection of Victorian and traditional furnishings are reflected throughout the inn. Come and experience for yourself why Holden House has the distinction of being featured in hundreds of guidebooks, magazines and publications worldwide! 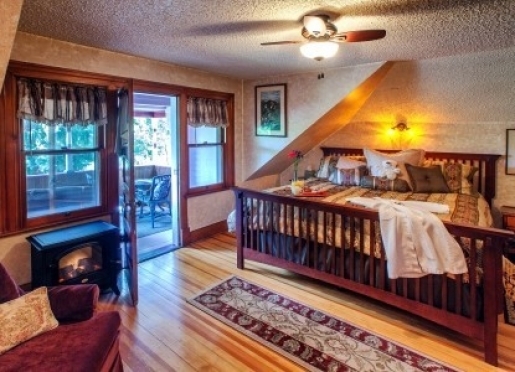 Recommended in "Romantic Inns of Colorado-Winter Romance" by Rocky Mountain Motorist Magazine. Featured in Glamour Magazine as one of the "Best Country Inns for Fall Weekends"
Best Bed and Breakfast for Innovation in Hospitality 2011 from the Colorado Springs Convention and Visitors Bureau. "Holden House is Grandma's, but with a touch of class." Our guest suites feature beautiful furnishings including a queen or king bed, private sitting areas, private baths,fireplaces (winter months only), snuggly signature robes, color/cable T.V., DVD player, refrigerator, clock/radio/CD, iron/ironing board, hairdryer and private label amenities. Some of the suites also feature oversized tubs for two and private balconies. A full gourmet breakfast is included, served in the elegant formal dining room or as an additional option, in the privacy of your room for an additional "Romance Package" charge. Our guests enjoy relaxing in the inn's many common areas. The main house boasts a living room with an authentic Van Briggle tile fireplace, comfortable wing back chairs, and an overstuffed Victorian sofa. The inviting front parlor with a T.V./VCR, and a verandah offering old fashioned porch swings, white wicker furniture and mountain views, sets a relaxing mood. Enjoy relaxing in our many common areas; the beautiful living room with antique tile, views of our cottage garden and the mountain foothills, and our "secret" back garden with gazebo and fountains. We also have the modern convenience of a business center for those needing the use of a computer. Come and see for yourself why Holden House has been selected as the "Best B&B for an Anniversary/Honeymoon" by Arrington's Inn Traveler magazine. Whether you're traveling for business or pleasure, we have the perfect accommodations for you! The main house offers two lovely suites, each individually appointed and easy access to our common areas. In the adjacent carriage house, you'll experience an English Cottage theme. There are two lovely sitting rooms, a charming bay window seat displaying a collection of stained glass where "Harvey", the 6'3" white rabbit sits obtrusively, and a cozy front porch for lazy afternoons. In the house next door's Rose Victorian, the Independence suite's guests are also treated to a private front porch with porch swing, a foyer with sitting area and original built-in parsons bench, and a spacious two room suite with hardwood floors. Fine restaurants, unique gift shops and area attractions are nearby, some within walking distance. Sallie and Welling will be more than happy to assist you and their knowledge of the area can be helpful in planning your itinerary. Each of our six guest suites including our Aspen and Cripple Creek in our main house, the Goldfield and Silverton in our carriage house and the Independence and Pikes Peak suites in our adjacent Rose Victorian, all feature a sitting area, private bath, in-room gas/electric fireplaces (winter only), central air conditioning (summer months), oversized bubble bath "tub for two", color/cable TV with DVD player, telephone/modem and wireless internet, cd player/radio, hair dryer, iron/ironing board, soft robes, private label amenities and your own refrigerator. We also offer an afternoon wine social, 24 hour coffee/tea, and our famous "bottomless cookie jar". Full gourmet breakfast is included and served in the elegant formal dining room, or in the privacy of your suite, for an additional charge. In addition to our Main House suites, visit our additional in the Carriage House and the our adjacent Rose Victorian. In the Rose Victorian house, the Independence suite was selected as one of Country Inns - Waverly Room of the Year and our Pikes Peak suite is our newest room with a private balcony and kitchenette and can be rented nightly or for an extended stay! Holden House also means "Business" guests are welcome here. You'll find all the comforts of home with the amenities and corporate convenience of a fine hotel. 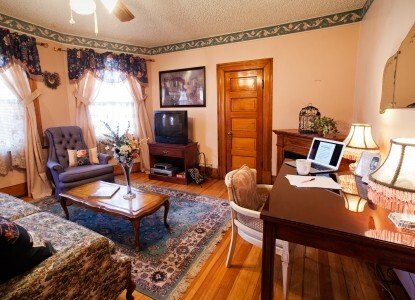 In addition to wireless internet throughout the inn, we offer a main computer workstation with printer and internet access, fax machine, copier, in-room telephone, cable TV, desk, refrigerator, our special early riser's breakfast and quick check-out. We're the perfect place for a corporate traveler getaway. After a day of appointments, we'll welcome you with a glass of wine and evening appetizers from 5-7 each evening. Our helpful innkeepers and quiet surroundings will help ease the stress of a busy workday. 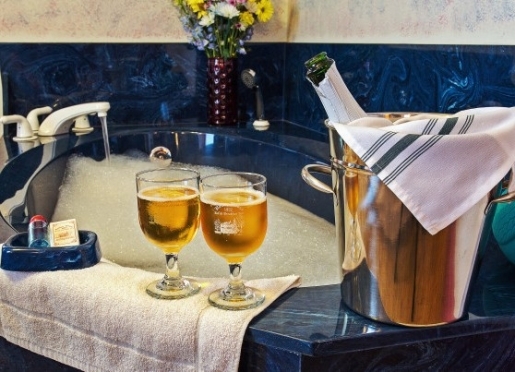 Or, you may want to soak your troubles away in one of our oversized tubs or work on your laptop in the privacy of your room in front of a cozy fireplace. Let us be your "Home Away from Home!" The adjacent Carriage House offers a special place for quiet and privacy with an English Cottage theme. Each of the two private and separate suites feature a queen bed under skylight, sitting area, color/cable TV/DVD/CD/clock radio, refrigerator, hair dryer, iron/ironing board, telephone/modem hook-up, gas fireplace (winter only) and air conditioning (summer). The house also has a common-shared living room/parlor accented with blue Delft and tasteful accents, a kitchenette with sink and microwave only, and it's own front porch with a view of the back garden. Whether you're seeking seclusion or are traveling with another couple, you'll love this peaceful retreat with an English cottage atmosphere. Awake to the aroma of homemade muffins hot from the oven, freshly ground gourmet coffee or specialty teas, fresh fruit, juice and a variety of delectable entrees such as Sallie's famous SouthWestern Eggs Fiesta, German Puff Pancakes with Spiced Apples, or Ruffled Crepes Isabel. While enjoying your full gourmet breakfast, experience traditional hospitality and good conversation. 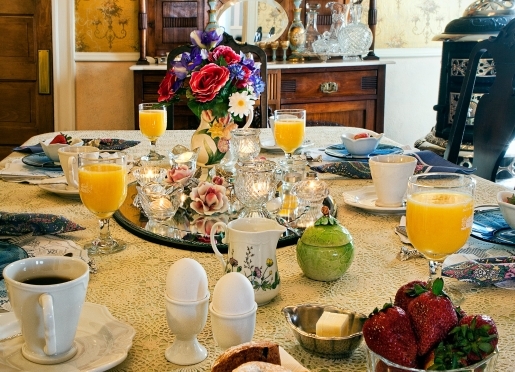 Breakfast is served at your choice of 8:00 or 9:00 A.M. in the elegant formal dining room. Holden House also offers a special Romance "Breakfast in Bed" Package for an extra charge. 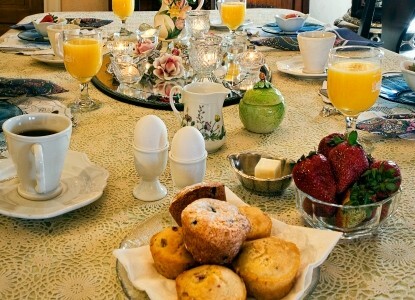 Arrangements can be made for our Early Riser's Breakfast prior to 8:00, should an early morning schedule be necessary. 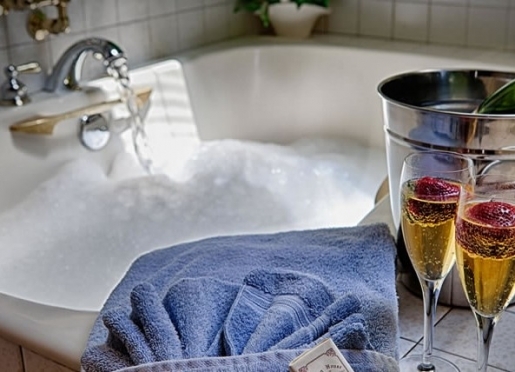 Daily maid service, modern en-suite amenities, complimentary refreshments, afternoon wine social, our legendary bottomless cookie jar with homemade Chocolate Chunk/White Chocolate Chip cookies and evening turn down service are just a few of Holden House's special pampering touches. Compare the value of our complimentary services and amenities. Only one mile and less than 5 minutes to downtown! Our all- suites inn is the perfect place to stay on your next business trip. You'll return from a hectic workday to a quiet, clean and safe environment. "Holden House offers the perfect place to stay when traveling on business. The amenities are exceptional and the service impeccable. I wouldn't think of staying anywhere else in Colorado Springs on business." 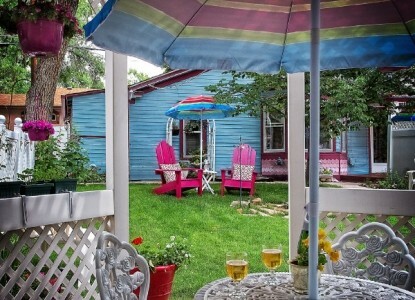 Holden House 1902 Bed & Breakfast Inn, is conveniently located in a quiet residential area just one- mile west of downtown Colorado Springs and provides easy access to I- 25 and Hwy 24. We offer ideal accommodations for anyone traveling to the Springs on business. Originally built in 1902, our side- by - side Victorian homes offer historical charm with the modern facilities you'll find at a fine hotel. Our wish is to make your business or corporate stay stress- free and comfortable with a smiling and friendly innkeeper to greet you and accommodations to suit your needs. You'll find all the comforts of home with upscale amenities and corporate convenience. In addition to wireless internet throughout the inn, we offer a main computer workstation with printer and internet access, fax machine, copier, in- room telephone, cable TV with DVD, desk, refrigerator, our special early riser's breakfast and quick check- out. We're the perfect place for a corporate traveler getaway. After a day of appointments, we'll welcome you with a glass of wine and evening appetizers from 5- 7 each evening. 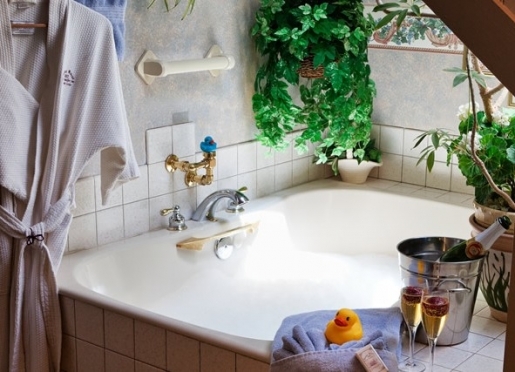 Our helpful innkeepers and quiet surroundings will help ease the stress of a busy workday. You can soak your troubles away in one of our oversized tubs or work on your laptop in the privacy of your room in front of a cozy fireplace. Let us be your "Home Away from Home!" Here you'll find all the amenities and convenience of a fine business class hotel, combined with the peace and quiet of a luxury bed and breakfast inn. Our resident InnCat Mingtoy will make you feel at home and provide a "purr-fect" stay. She looks on the inn as her own and do not permit guest pets. If you need pet-free accommodations, the Goldfield, Silverton, Independence and Pikes Peak suites are suitable choices. Mingtoy - Is the 6th in a long-line of Mingtoy's owned by Sallie over the years and definitely keeps Mei Lin on her toes. Mingtoy is the daughter of a beautiful white and black mother cat who was abandoned outside our veterinary clinic. So precious was she, that we waited patiently for two months to receive her from a foster home and right away, she became a hit with our inn guests. Her favorite toy is a short pole with a lure at the end. Sallie's family ancestry is of Welsh descent and in Wales, black cats are known for bestowing good luck. Be sure to visit and pet our Ming and you'll be sure to have not only the luck of the Welsh, but the luck of the Irish (she was born on March 17th, St. Patrick's Day and her beautiful green eyes are fitting) on your wonderful vacation in Colorado Springs at Holden House. 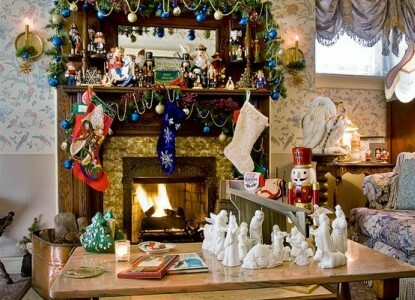 While anytime of the year is special at Holden House, the Clark's make the holiday splendor come alive with trees, lights and decorations throughout the inn. A stay during the Christmas and New Year's holidays will bring a smile and Happy Holiday to your travel experience. For aspiring innkeepers, the dream of owning and operating their own bed & breakfast inn is a primary focus. For innkeeper/consultants, helping that dream to become a reality is a profession. Innkeepers, former innkeepers and real estate brokers have turned to consulting in an effort to increase research information and professional attitudes for would-be bed & breakfast operators. Inn consultants have created a profession within a profession. Many innkeepers have written books on the subject and the availability of information has increased tremendously in recent years. For Welling and I, owning and operating Holden House Bed & Breakfast Inn located in Colorado Springs, has become the reality of a rewarding career combined with hard work and dedication. That's the reason we started teaching others and providing consulting services about the business side of innkeeping. Many people wake up one day and think, "Let's open a bed & breakfast! It will be fun to entertain guests in our home. We can cook and clean...we can do that!". But there's also the business side of innkeeping. It's not a "Field of Dreams"-build it and they will come. Maybe you've enjoyed staying at B&Bs and have experienced the relaxing side of the inn environment, but remember that you haven't seen the behind the scenes work of this people intensive industry, the mound of office paperwork, the constant interruptions during the day and the piles of laundry waiting to be finished. 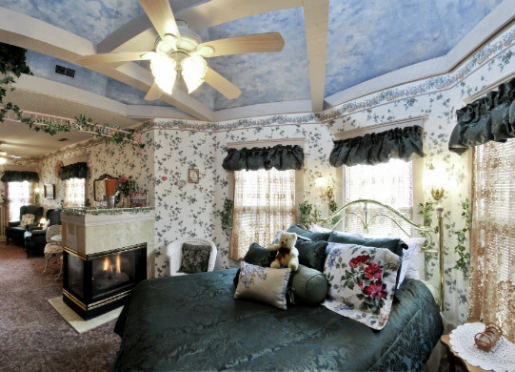 There are many issues to consider when deciding whether the B&B business is for you. The bed & breakfast industry is very personal... personal because innkeeper hosts spend a lot of time with their guests and must be very involved with every facet of daily business operations. This deserves careful consideration. As our fellow innkeepers already know, the daily routine of an innkeeper combines early rising, cooking, cleaning, shopping, laundry, banking, bookkeeping, advertising and marketing, check-ins, reservations, management, and more! Trading the office's eight hour, five day a week job for a bed and breakfast can seem like a great alternative, until the realization becomes a seven day a week occupation with 12-18 hour workdays and an office you can't leave behind. But, it does have its upside, too. Meeting friends from all over the country is like being an armchair traveler. Acting as a "goodwill ambassador" by helping guests with travel and activity plans is very rewarding. Showcasing the home you have worked so hard to restore or build is a great personal benefit. The freedom of owning your own business also gives you the pleasure of not answering to anyone but yourself and your guests. Operating a B&B also offers a 'stay at home' business, beneficial to the single or partner entrepreneur. As inn consultants, we feel there is a great responsibility toward aspiring innkeepers. Organizational skills and information services are required attributes for consultants. There is an ethical necessity to provide professional services to the industry. With the increase of professionalism in the B&B business, inn consultants must also present a professional attitude. Inn consultants should have experience based on number of years in operation, have organizational skills and have an extensive background with industry resources. A point to remember, no one can be an expert at everything. What is your experience within the B&B industry? How long have you been in the B&B business? How long have you been teaching seminars/consulting? What are your specific strengths in inn consulting? How long did you research before opening your B&B? Do you attend continuing education conferences & seminars? How many B&B's have you sold? How many B&B's have you stayed in? Have you ever operated a B&B? What is your experience within the B&B industry and what experience do you have with zoning and planning regulations? We feel it is important for aspiring innkeepers to get a "jump start" on their future by doing their research first. This allows you to make an informed decision regarding the property, set-up, financing, operations, and marketing. In an area with little or no B&Bs, you are the "educational B&B expert" if you've planned properly. One of the most difficult things today about starting a bed & breakfast inn is working with local officials. Most officials and neighborhood residents don't understand the business well enough to know the positive effects B&Bs can have on a neighborhood. You may have to become the "B&B educator" if you're breaking new ground. 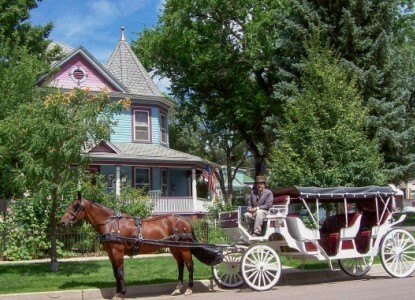 In 1986 when we opened Holden House, we were one of three professional B&B's in the Colorado Springs area. Now the Pikes Peak Region boasts over 30, and the western states continue to see an increase in the number of new B&Bs. When we first started researching the B&B industry in 1982, there was very little information available about starting a bed & breakfast. Since that time, great strides have been made. Today's wealth of nationwide seminars and information provides the prospective innkeeper with the opportunity to learn from the experience of others. 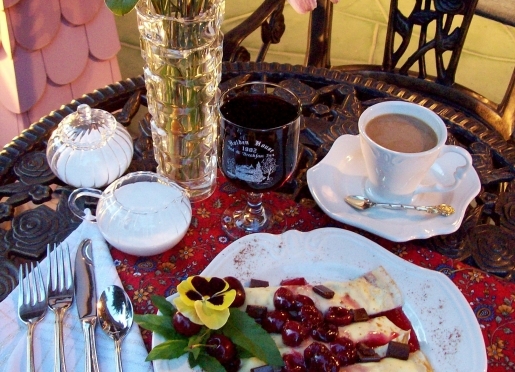 Potential innkeepers who do their homework have found it much easier to start and operate successful bed & breakfasts. The availability of start-up information and continuing education for innkeepers today will have a positive effect on the industry in years to come. Working in a bed & breakfast as an apprentice offers a reality view into daily inn operations and provides a stable research background. Financial institutions will question aspiring innkeepers as to what they know about running a bed and breakfast and what research they've performed before approving a bank loan. It gives you credibility when putting together a business plan and asking for financial assistance, if you can provide a solid research background. The cost that is expended on classes, publication and even on-line assistance will pay you back many times over. What we tell aspiring innkeepers is that it's much better to spend some dollars on education ahead of time-if you open a bed and breakfast, you'll be well prepared and if you decide it's more fun just to stay in B&Bs, you'll have saved time and money from the research. Existing inns and bed & breakfast associations should be used as research and educational resources. Aspiring innkeepers should stay at B&B inns whenever they travel, offer to pay the innkeepers for extra consulting time and gain information on inn operations by reviewing each property as to personal likes and dislikes of features. State and local organizations create an invaluable support system regarding networking, sharing common issues, education and quality assurance. Attending state association conferences will offer a wealth of information to would-be innkeepers. When Welling and I saw the need for bed & breakfast networking in 1987, we founded Colorado's B&B association, "Bed & Breakfast Innkeepers of Colorado". Since that time, the association's annual Colorado conference has become a great educational tool for both aspiring and current innkeepers. The educational benefits of association membership are very important to this career choice. Most state bed and breakfast associations offer affiliate and associate memberships for aspiring innkeepers. This provides a good support and networking base, even if you don't yet own a B&B inn. It will keep you in the mainstream of that particular state's B&B information network. We love our innkeeping careers and feel fortunate that we took time to research our dream before starting out. It's extremely important for the aspiring innkeeper to consider in advance what it takes to run a successful B&B. Asking some well placed questions and doing some research will put you on the track to being great future innkeepers or just happy inngoers, depending on the final decision. 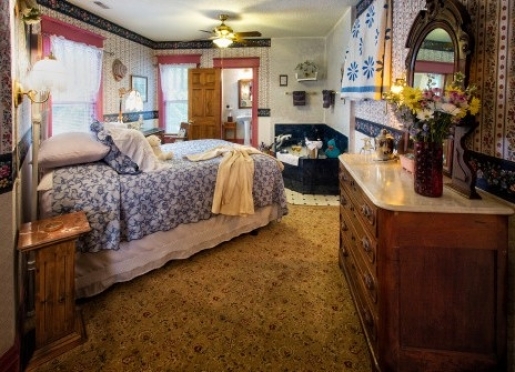 Are you ready to start your own bed & breakfast inn? Come and discover the inns and outs! The Clarks have written several books on the industry, "Colorado's Bed & Breakfast Industry and Marketing Analysis of a Small Inn", and Sallie co-authored the book, "Innkeeper to Innsitter through the Eyes of Experience". Sallie & Welling Clark can be contacted at: Holden House-1902 Bed & Breakfast Inn, 1102 W. Pikes Peak Avenue, Colorado Springs, CO 80904 Email: [email protected] Phone: 719-471-3980 or 888-565-3980. Colorado Springs, Manito u Springs, Cripple Creek and the Pikes Peak Region. It's no wonder Katharine Lee Bates wrote the words to "America the Beautiful", inspired by her mule ride up Pikes Peak in 1893. From the majestic snow capped Pikes Peak to the towering red rocks at Garden of the Gods and Red Rock Canyon, the region has something for everyone. Take the famous Cog Railway or drive the Highway to the top of 14,110 foot Pikes Peak, tour the United States Air Force Academy, hike in Garden of the Gods or Cheyenne Cañon Park, shop in restored Old Colorado City or quaint Manitou Springs , visit our area's many museums and historical sites, experience whitewater rafting on the Arkansas River near Cañon City, take the scenic train or drive over the bridge at Royal Gorge or take a turn at the slots in Cripple Creek's historic gaming district. Holden House is always nearby. Enjoy clear spring mornings, warm summer days, view changing aspens in the fall, or relax by the fire on quiet snow covered afternoons. Historic accommodations, natural beauty and fun filled adventure await you! Spend a few days, a week, or more. You'll find plenty to keep you entertained. is owned today by the Navigators. The Castle is open for tours, afternoon teas and special events. Around the turn of the 19th century, Colorado Springs became the top gold mining exchange center of the world and was home to many of the nation's millionaires. The first Colorado City was founded years earlier in 1854 as a supply center for the mining camps. It was a major commercial and entertainment area for those seeking their fortunes of gold up the pass in the Cripple Creek mining districts. After the founding of Colorado Springs as a "dry" city by General Palmer, the area of Colorado City was known for its shops, saloons, gaming establishments and its racey "red-light" district. Although closed off today, tunnels exist under the Avenue, built so respectable Victorian gentleman could pass across the street without being recognized. Today, the historic district of "Old Colorado City" is sprinkled with fine shops, restaurants and art galleries. During the 1800's, Colorado Springs became popular with the medical community with the quest for health; Colorado Springs and Manitou Springs boasting clean air and the healing waters of local mineral springs. Our visitors are equally impressed by similar activities that brought those initial tourists "on holiday" to experience the Pikes Peak Region of the Rockies. Our area provides a splendid and varied Colorado vacation spot for today's travelers. After a hearty breakfast with us at Holden House, a short drive will take you to Garden of the Gods Visitor Center where breathtaking views of the red rock formations in Garden of the Gods Park and a trip up the cog or highway to Pikes Peak will provide you with many photographic opportunities. Right down the road is quaint Manitou Springs (pronounced Man-i-too). As you browse through the shops, be sure to take a drinking cup and taste the natural springs scattered around town. If you've worked up an appetite after a full morning, we have more than 50 restaurants that are within a few miles of Holden House. After a leisurely lunch or afternoon snack, take a scenic drive up Ute Pass to the Manitou Cliff Dwellings. These authentic Anasazi cliff dwellings were transported to Colorado Springs from the Mesa Verde (southwest Colorado) area in the late 1800s. The ruins provide a compelling setting for the Indian dancers who perform from June through August. As the sun begins to set, make your way to Seven Falls. Nicknamed the ''Grandest Mile of Scenery in Colorado'', Seven Falls cascades 181 feet in seven distinct steps down a solid cliff of Pikes Peak granite. Also lit at night, you're welcome to hike the 224 steps that take you to the top, step on the elevator, or observe the beauty from the base of the falls. North Cheyenne Cañon, a free city park, offers scenic creekside and mountain trails, peaceful surroundings and features spectacular Helen Hunt Falls, named for Helen Hunt Jackson, the author of the widely acclaimed book Ramona, about the plight of native Americans during the 1800's. Portions of her original home are housed in the Colorado Springs Pioneer's Museum in downtown. We love to embrace the natural wonders that the area provides. From the leisurely trails found in Cheyenne Cañon, Florissant Fossil Beds National Monument and Bear Creek Regional Park to the more challenging Barr Trail up Pikes Peak, Waldo Canyon or Mueller State Park, an avid hiker can always find someplace to take in nature, birds and wildlife. While Heather enjoys the outdoor offerings in the summer, she prefers to stay indoors during the winter. Museum tours such as those at the Pioneer's Museum, Miramont Castle and musicals at the Pikes Peak Center for Performing Arts, the Colorado Springs World Arena or the Fine Arts Center will keep guests entertained during cool Colorado evenings. Beth especially enjoys the Cheyenne Mountain Zoo where you'll see the largest giraffe exhibit in North America. She recommends the many fine dining and shopping establishments in Old Colorado City, downtown Colorado Springs and Manitou Springs. Our guests appreciate the variety of free and scenic attractions. You can tour the U.S. Olympic Training Complex, stroll through Garden of the Gods Park and visit the famous cadet chapel at the Air Force Academy. You might also favor the striking beauty of the Pikes Peak Highway or the Cog Railway. Owner-innkeepers, Sallie and Welling, and their knowledgeable staff, are always happy to offer personal recommendations to our many sites, activities, dining and shopping areas in the Pikes Peak Region of the Rocky Mountains, no matter what your preference. Jeep, Balloon and ATV tours to view the aspens or just have some summer fun! For the moderate or the adventurous guest, we have a variety of activities that will keep you busy. From biking down Pikes Peak to enjoying an early morning balloon ride over the city, the possibilities are endless. Cheyenne Mountain Zoo - the largest giraffe herd in North America! 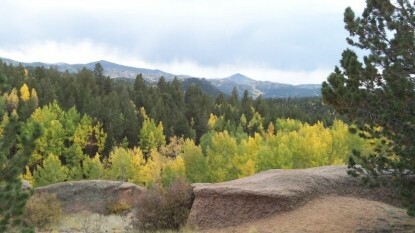 Jeep and ATV tours to view the aspens or just have some summer fun! December-Festival of Lights Parade, Lighting displays at the Cheyenne Mountain Zoo, Rocky Mountain Christmas in Old Colorado City and many local holiday activities. Let us help you plan your trip. Call the Colorado Springs Visitors Bureau at 1-877-PIKES-PEAK and the Manitou Springs Chamber at 1-877-642-2567 for free vacation information. For an online tour of the area, jump to the Colorado Springs Convention and Visitors Bureau Web Site. We have listed for your convenience the web link to the Colorado Hotel & Lodging Association, Colorado Tourism Office , the Colorado Restaurant Association and the Manitou Springs Chamber and Pikes Peak Country Attractions. Take exit 141 (the highway 24 Manitou Springs exit). When you get off the freeway, head west (toward the mountains) onto hwy 24. You'll come to the first major cross street, which is 8th street. This will dead end at Colorado Avenue and you'll turn left onto Colorado. Continue down about 2 1/2 blocks to 11th street and turn right onto 11th. Go down one block on 11th St. and you'll see the inn across the street on your left. It's a big blue Victorian that sits on the corner of 11th and West Pikes Peak Avenue. Holden House is west of interstate 25 at 1102 W.Pikes Peak. 15 miles/20 minutes. You'll be on Drennan Rd. From the airport continue past Powers Blvd., and follow to Academy Blvd south twoard I25 bearing to the left as you connect with Academy Blvd. When you pass Manitou Springs 4 miles west/5 minutes, you'll be into Colorado Springs, look for 8th street (there will be a convenience store/gas station on your left). Turn left onto 8th street and this will dead end into Colorado Avenue. Turn left onto Colorado Avenue and continue down about 2 1/2 blocks to 11th St.
Make a right onto 11th street and go down 1 block. The inn is across the street on your left. 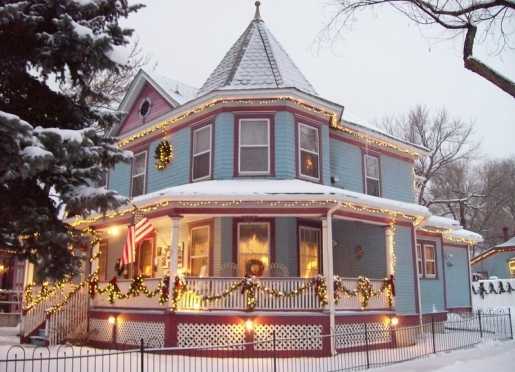 It's a large blue Victorian that sits on the corner of 11th and West Pikes Peak. Come in on Hwy 24. This will turn into Platte Avenue. Stay on Platte until you come to Cascade Avenue in downtown Colorado Springs. This will dead-end at Cascade and turn left on Cascade. Go down a few blocks and turn right at the Antlers Hotel onto Colorado Avenue. Continue down one mile and turn right onto 11th St. It's a big blue Victorian that sits on the corner of 11th Street and West Pikes Peak, West of the Interstate.